First aid for dry skin. 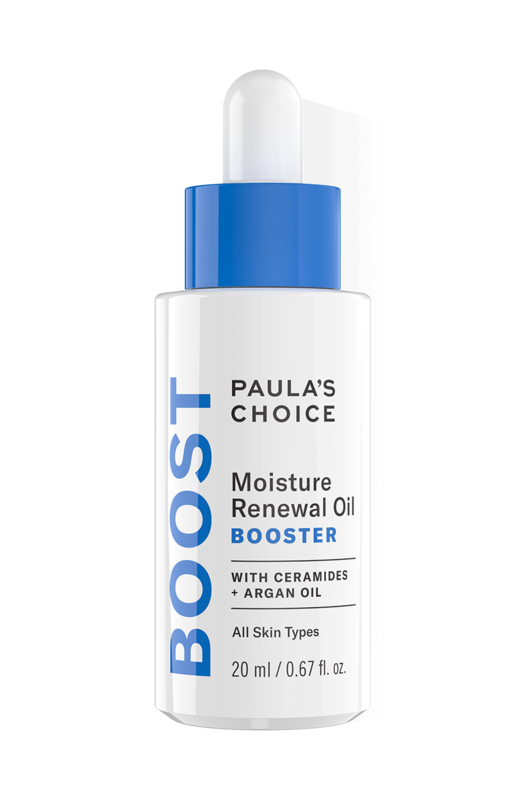 This booster contains a nourishing blend of plant oils to instantly smooth and restore dry and flaky skin. The fragrance free oils drench skin with the essential fatty acids and antioxidants it needs to retain moisture for healthier skin. The light-weight formula leaves skin radiant and smooth. This is the first time I can say that a product is Holy Grail status for me. I've really struggled to find the right products for about a year now, mainly due to my eyes being very sensitive and everything I put on my face irritated them. After many false alarms I turned to this as pretty much a last resort. Thank god I did as it feels perfect on my skin. Really soothing, comfortable, moisturising and softening without being greasy or shiny. It doesn't have the heavy occlusive feeling that petroleum based products can have, and that always seem to make my face sweat more when I'm exercising. It feels really light and natural, like your own skin! I'm using it as my main moisturiser but put putting the Resist antioxidant serum underneath it, and my Jane Iredale powder on top - which glides on beautifully over this. I think I am very sensitive to products that are chemical heavy, so this is perfect. The Resist antioxidant serum is also without some of the Glycol ingredients that I seem to be more sensitive to, so it's a great combination. I only have the sample size and it's early days, but this is already a real winner. I find the dropper a bit awkward though, as there's a chance you could knock it over, which would be a nightmare. But apart from that I love it and will be purchasing the full size soon. I must give another shout out to the excellent customer service. They have been patient beyond belief with my incredibly frustrating quest to find right skin care products. Customer Care: Thank you for your review. We are happy to hear that you are finding this product to be suitable for your skin and thank you for the compliment. I have suffered from rosacea for 40 years andhsve struggled to find products suitable for my skin. I need a serum prior to using a moisturiser because my skin gets so dry and sore. I have been using this product for about 6 weeks and it immediately soothes and nourishes my skin to such an extent that I no longer use any medication. A fantadtic product. Thank you PC! NightOwl - Better than a facial! When my skin feels a bit tight and tired, I stroke on maybe 3-4 drops of this oil before bed and wake up looking glowing again. I have breakout-prone combination skin so was a little wary about using this product. I only use it on the drier parts on my face; forehead, under the eyes and cheeks - and I absolutely love it. When my skin feels delicate and like it needs a boost, this sinks in beautifully and leaves my skin super soft when I apply it overnight and get up in the morning. A little goes a long way and if mixing with your moisturiser you literally only need a drop or two. I do it on the back of my hand and then smooth on - soaks in super quick. Simmondsia Chinensis (Jojoba) Seed Oil (non-fragrant oil/skin-soothing/antioxidant/emollient), Carthamus Tinctorius (Safflower) Seed Oil (non-fragrant oil/skin-soothing/antioxidant/emollient), Prunus Armeniaca (Apricot) Kernel Oil (non-fragrant oil/skin-soothing/antioxidant/emollient), Helianthus Annuus (Sunflower) Seed Oil (non-fragrant oil/skin-soothing/antioxidant/emollient), Vaccinium Macrocarpon (Cranberry) Seed Oil (non-fragrant oil/skin-soothing/antioxidant/emollient), Argania Spinosa Kernel Oil (non-fragrant oil/skin-soothing/antioxidant/emollient), Borago Officinalis (Borage) Seed Oil (non-fragrant oil/skin-soothing/antioxidant/emollient), Oenothera Biennis (Evening Primrose) Oil (non-fragrant oil/skin-soothing/antioxidant/emollient), Echium Plantagineum Seed Oil (non-fragrant oil/skin-soothing/antioxidant/emollient), Ceramide NS (hydration/skin replenishing), Cholesterol (hydration/skin replenishing). Can I use this oil around my eyes? Resist Hyaluronic Acid Booster can be mixed with any well formulated eye cream, eye serum, or eye gel. Add one or two drops to your eye-area product of choice, and apply, or you can apply the Hyaluronic Acid Booster first and follow with your eye-area treatment. Is Moisture Renewal Oil Booster suitable for rosacea-prone skin?